Lorraine McCarty brings depth of knowledge and experience to all facets of property management and tenancy law. 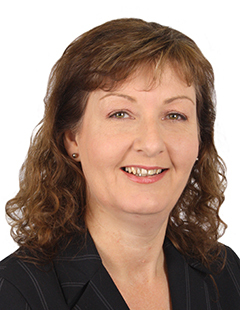 Commencing her Property Management career for EVES as Account Manager Lorraine McCarty also represented the company in Rotorua for all mediation and tribunal work. For four years she prepared the cases and facilitated the mediations as well as attending tribunal hearings. The awareness of what happens when things go wrong has proven excellent grounding for handling tenancies on a day-to-day basis. Lorraine makes sure things go right by applying her understanding of legal rental processes to her managements, vigilant with tenant selection, inspections, communication, arrears and addressing concerns before they become problems. She also works to enhance her landlord's peace of mind by ensuring good market rents are paid and by advising any maintenance issues so her tenants live in environments they enjoy and look after. Lorraine appreciates the supportive, fun team she works with and the benefits of the backing of a large real estate company with sound resources and a good reputation with landlords, tenants and when it becomes necessary, the Tenancy Tribunal. She keeps up-to-date with developments in property management through her many contacts in the industry and by attending EVES' regular training courses. Lorraine has proven she can keep the balance in her role and please both landlords and tenants. We had an unfortunate experience previously with our property manager in Rotorua and decided to contact Lorraine after seeking advice from other landlords and online forums. Lorraine came highly recommended. After our initial contact it seemed clear that we were dealing with a real professional. With each issue the house has encountered over the years Lorraine has been quick to assess and resolve the problem. I believe this is not only down to her experience in the industry but also a sound intuition, common sense and proficient organisational abilities. We have been particularly impressed with her communication skills which I think are exemplary. In my opinion such skills are absolutely crucial in order to develop rapport and trust between manager and client as part of a healthy working relationship. In short we are delighted to have Lorraine manage our property and feel genuinely fortunate to have found her! I knew you would come through yet again. You're a STAR. Thank you for your service and assistance with situations we have faced. Lorraine has been an excellent person to deal with. She has gone the extra mile and was always professional. I have had my share of property managers but Lorraine is standout, friendly, approachable, reliable and open to challenges at very short notice. I facilitated scores of mediations with Lorraine in her role as Property Administrator for EVES Realty. Lorraine was always well researched, organised and fully prepared. I hold her in the highest regard for her composure and professionalism in often highly stressful and emotionally charged disputes. She projected empathy and sought opportunities to enhance the client relationship.